The Columbia River Bridge, referred to locally as the Hood River Bridge, was built in 1924. The Bridge was vertically elevated and a lift span added in 1938 as the river water level was raised with the completion of the Bonneville Dam. The Port of Hood River purchased the bridge in 1950. The existing structure is 4,418 feet long and has two approximately 9.5-foot wide travel lanes with no pedestrian or bicycle facilities. It has open-grid steel decking, with a 246-foot lift span over the river navigation channel. The Bridge spans the Columbia River, connecting the cities of White Salmon and Bingen in Washington to the City of Hood River in Oregon. This bridge is the second oldest Columbia River crossing and one of only three crossings in the Columbia River Gorge National Scenic Area. This major transportation route serves as an important link to local communities, the region, and interstate travel. The economic well-being of this region is dependent on this Columbia River crossing. The primary purpose of this project is to improve the movement of goods and people across the Columbia River between the Bingen/White Salmon, Washington and Hood River, Oregon communities. Southwest Washington Regional Transportation Council (RTC) along with the Oregon and Washington Departments of Transportation (ODOT & WSDOT), the ports of Hood River and Klickitat, and the local cities and counties have been working in partnership to find a long-term solution to the Columbia River crossing between Hood River in Oregon and White Salmon and Bingen in Washington. 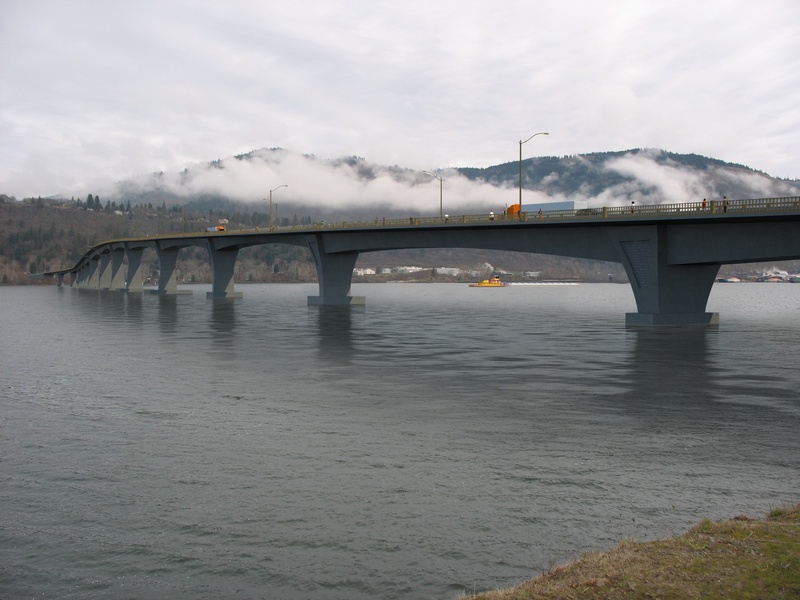 The SR-35 Columbia River Crossing Study was conducted in response to local business and resident concerns about the safety and viability of the existing Hood River Bridge. The project began in 1999, with the design of a feasibility study. In 2000, the feasibility study began by identifying project issues, purpose and need statement, and a range of crossing corridors and facility alternatives. This phase (Tier I) determined and initiated the environmental review process, and narrowed the corridors and facility alternatives to those that are most promising and practical. In 2001, the next phase (Tier II) began resulting in the selection of crossing corridor, refinement of the most promising long-term alternatives, and identification of short-term improvement options. This phase also undertook a financial feasibility study to determine if there are sufficient financial resources available to fund a long-term improvement project. In 2002, the final phase (Tier III) of the feasibility study was initiated. This phase was completed in 2004, resulting in the selection of a preferred alternative through a Draft Environmental Impact Statement. In 2010, a Bridge Type, Size, and Location Study (TS&L) began. Bridge concepts were analyzed to identify the concept that best meets the needs of the region. This phase resulted in a recommended bridge type. With a Draft Environmental Impact Statement and preliminary engineering completed, the next step in the process is the development of a Final Environmental Impact Statement. Although funding is unsecured at this time, a scope of services outline has been developed that lists the activities and areas of further study needed to complete a Final Environmental Impact Statement. Final engineering and right-of-way purchase would follow. Given current local, state, and federal transportation funding limitations, construction of the new SR-35 Columbia River Bridge is likely to be a long-term future project. The SR-35 Columbia River Crossing Study has recommended that a new bridge be constructed to replace the Hood River Bridge. This new bridge would be constructed just west of the existing bridge. It would be constructed while the existing bridge is still in place, with the existing bridge being demolished once the new bridge is complete. A concrete segmental box girder bridge is the recommended bridge type. 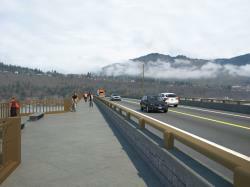 The new bridge would include two 12-foot travel lanes and 8-foot shoulders. 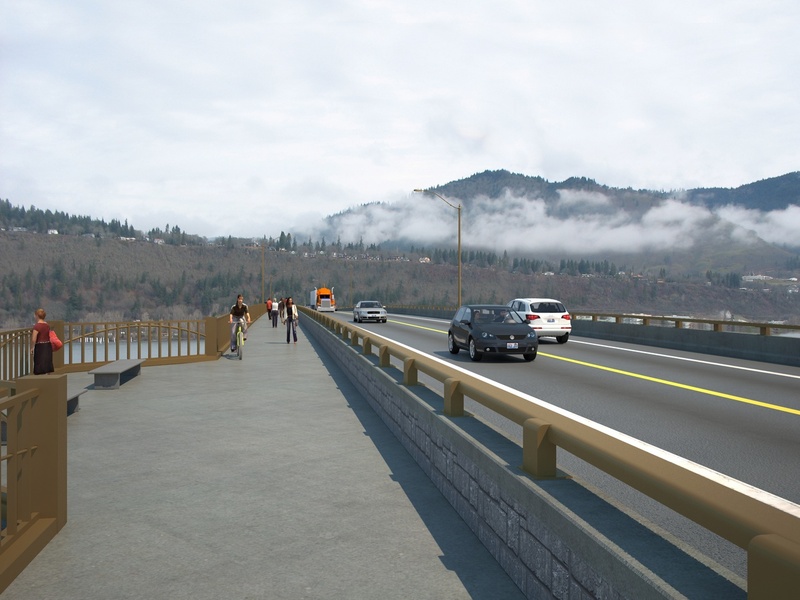 Multimodal options for walking or biking across the bridge would be provided with a 12-foot pathway with two overlooks on the west side of the bridge. This bridge would have a 500-foot main span to improve the navigation clearance. Gateway markers and aesthetic treatments will be placed at each entry point to provide a coordinated treatment with the stone formwork and railings used on the multimodal pathway. The project’s overall cost range (in 2011 dollars) is $190-205 million.